Read the full species account >>. The atlas is a uniting force bringing together the birding and wildlife-watching community, wildlife management agencies, academic institutions, industries, professional biologists and outdoor user groups, in a common stewardship goal: better conservation of our birds and the places they live. The 2010-2014 fieldwork is complete, but the partnership continues to apply the findings to research and conservation. We strongly encourage interested researchers to contact us at cartuso@birdscanada.org with project ideas. Welcome to Manitoba's first Breeding Bird Atlas! The Manitoba Breeding Bird Atlas partnership is proud to publish online one of the largest volunteer-based initiatives in Manitoba's history, and a major new resource for conservation. Leading Manitoban bird experts describe the distribution, abundance, habitat and conservation of 312 species of birds that bred or potentially bred in the province between 2010 and 2014, beautifully illustrated by some of Manitoba's finest photographers. Detailed maps show where each species occurs and how common it is. Graphs help show what is behind the patterns of distribution and abundance, and a series of tools allows you to explore and download the information. The project business model, designed in 2009 by Bird Studies Canada, Environment and Climate Change Canada's Canadian Wildlife Service, the Manitoba Ministry of Conservation (now Sustainable Development), Manitoba Hydro, Nature Manitoba, the Nature Conservancy of Canada, and the Manitoba Museum, teamed a small group of professionals with an army of volunteer birdwatchers and many generous donors from the government, foundation and private sectors. The atlas is founded on the skill and dedication of more than 700 citizen-scientists organised by an amazing group of 16 volunteer Regional Coordinators who spent five years (2010-2014) logging over 42,500 hours of field data collection-the equivalent of 23 years of full-time fieldwork by one person. More than 500 volunteers were trained or directly supported, building significant new science capacity in Manitoba's communities. 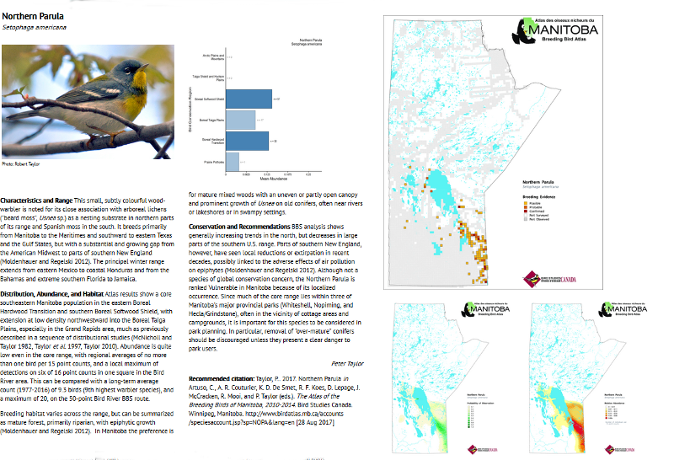 This atlas is the most comprehensive, current information source on the status of Manitoba's breeding birds. More than 325,000 records of 308 species are included in the database, including more than 14,600 records of 32 Species At Risk. It is also one of the most extensive bird atlases published anywhere online to date. The entire contents-maps, species accounts, graphs, tables, raw data, and more-are available to everyone free of charge. Professional conservation and natural resource practitioners will find a new suite of products to improve their day-to-day work. Educators in schools and universities will find new datasets to investigate hypotheses and new information to inform classroom learning. Birders around the world will find the latest maps and information for planning trips and using in the field. Last but not least, Manitobans interested in learning more about their local environment have a new resource to help them interpret this diverse province and its rich birdlife. The user-friendly digital presentations are designed for computers in the office and at home, and are well suited for viewing on mobile devices in the field. The species accounts can be also downloaded and printed.